20 A5 Cards featuring a photograph on one side and five questions or activity suggestions on the reverse. The variety of questions and activities means that work can be pitched at an appropriate level for most abilities. The cards have been designed to develop an enquiring approach to the subject and encourage observational and descriptive skills. This versatile set lends itself to whole class, small group or individual work, forming the basis for the whole topic or as a starter or plenary activities. Created with Wildgoose Education Ltd. 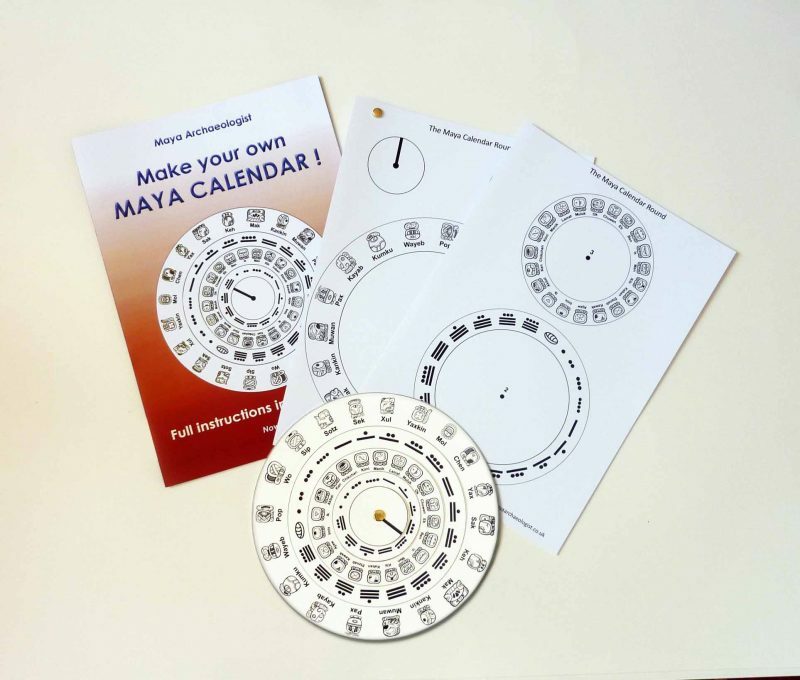 The pack includes the full Maya calendar with 5 separate rings to be cut out in white card, a pin for fixing the rings, information about the calendar, instructions and a quiz! This award-winning interactive book takes children on a tour through the Maya world. 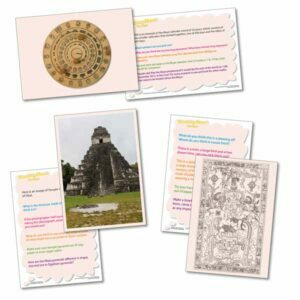 Engaging activity sheets encourage children to investigate the Maya world, through their calendar, maths, cities, art, writing and more. Simply hover a tablet or phone over the pages to watch players compete in the ancient ballgame of Pok-ta-Pok or explore a 3D Maya pyramid. This book really does bring history to life! A MUST for all teachers. There is much misinformation online and in books as this topic has not been taught before in the UK. I list the red-flags for spotting an unreliable resource. I’ve written a number of blogposts to help people understand the complicated Maya calendar. This is a general and wide-reaching resource that can be used by all primary teachers in history. The activity pack contains 10 Active Worksheets investigating different aspects of the past such as finding and excavating sites, artefacts, burials, the environment, dating ancient remains, deciphering ancient writing, magnificent monuments and the question of who owns the past. Background to the Maya, including a time-line and teaching activities that I wrote with Ian Mursell and Genner Llanes-Ortiz. A piece I wrote for Mexicolore on the misunderstandings of this culture.